HTC 'M8' images point to twin-sensor camera | What Hi-Fi? UPDATE: Yesterday we reported that leaked images purporting to be the new HTC One smartphone were leaked online. Well, it has now come to light that Mark Moons, the HTC regional director for the Benelux area of Europe has taken to his his Twitter account with to say "Somebody has been photoshopping..."
It is unclear whether he is talking about the images in question, but for now they should be taken with a large pinch of salt. 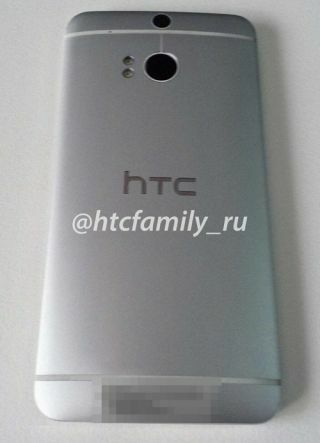 Leaked images on the @HTCFamily_RU twitter feed, depict what is likely to be the new HTC One successor: currently codenamed M8. The first image shows the back of the phone, and what appears to be the already rumoured, twin-sensor camera with dual-LED flash. This is rumoured to allow users to make use of Lytro-like refocusing, after the image has been taken. Nokia has already implemented a similar feature in the form of Nokia Refocus, avaialble on phones such as the Lumia 925. A second image shows what purports to be an outline of the new smartphone. On the face of it, the design is predominantly unchanged from the original HTC One. The only obvious difference is the lack of capacitative buttons, instead HTC has opted for on-screen controls in order to increase the screen size. Reliable tipster @evleaks recently predicted the new HTC flagship would be unveiled at its own event in New York in March, missing out on an MWC 2014 release. The new flagship HTC One phone is likely now to follow the launch of the new Samsung Galaxy S5, which is now likely to be launched on the first day of Mobile World Congress after Samsung sent out invites for its next Unpacked event. Apple will most likely follow suit with the iPhone 6 later this Autumn.